Welcome to my little corner of Blog Space. I have a condition, it’s incurable, sometimes terminal, but always eventful. Yes, I’m a writer amongst other things. I have a passion for books both reading and writing. In a way, it is my escape from the often harsh realities of life, a means to vent and disappear into a world of fictional characters and with luck, a way to make a difference to those in need. I’m a trucker in my everyday life, just a bloke doing what he does to make a living – outside of that is where the fun really begins. I live and work in Goole, East Yorkshire, but am originally a Midlander, born in Sutton Coldfield, Birmingham, West Midlands. Ex-army, my days in the forces play a part in my musings from time-to-time, and, as I learn more about the art of writing a good book, I also learn more about the fellow writers I stand shoulder-to-shoulder with, each in their own right, brilliant creative minds. 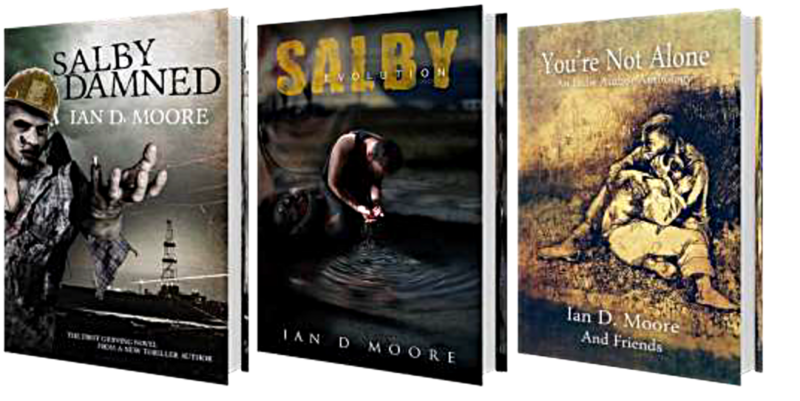 My first self-published work, Salby Damned, celebrates its one-year-old birthday on 20th August 2015, and has been very much a learning curve. Alongside that, I have since helped to create You’re Not Alone: An Indie Author Anthology, which raises money for Macmillan Cancer Support. Further works are in the pipeline and another edition of the anthology. My next novel, Salby Evolution, sequel to the first, is out now and available to buy from all digital platforms, as are my other titles, or in print via Amazon Createspace. Signed copies of my books may also be purchased directly. I’m glad I clicked your About link – because I had convinced myself that I’d read it. A good, informative bio which serves to remind blog followers and book readers that the author is human. Can’t believe this is the first time I’ve looked at your blog Ian… Just reading through some of your reviews again here. Hello Ian, you have an impressive author history. I’m looking forward to getting to know you and your books better. A pleasure to reach you Angelika. I’m part of an interactive international group of indie authors called the IASD. You’ll have seen the logo. Great folk helping one another. By all means, stop by and give us a shout. We welcome all readers and writers. Thank you for the free book to get started on your type of writing. I have never read any of your books because I have never heard of you before. So this is something new. I always love reading from someone new. Thanks again. Caitrianna I’m a fairly new writer, a trucker by profession. The book, Salby Evolution is the second in the series, I’m currently rewriting the first, Salby Damned. Onto be available on a short giveaway in the coming weeks. I will give you a shout when it is available. I hope you’ll enjoy my stories and thank you for your support. Caitrianna, Salby Damned, the first book in the series, is currently available on Instafreebie if you’d like to see where the story began. You’ll find it on this link. I like this page. I will certainly come and read the posts printed on it whenever I persuade myself to do that. I like the kind of subject matter that is mentioned here. I have also happily asked for the email subscription and communicated with you on social media, so thanks very much. Hello and thank you so much for your support. Indies like me value the interaction of our readers. It is always good to connect to a patron of the written word.